In most cases the Export Workouts to My Workout Library and Export Set to My Set Library are checked and not able to be unchecked, meaning they must be saved to your libraries. Adding or editing* a workout in MY WORKOUTS (MY W/O on phone). Adding a new workout to a practice. *If the workout has been used in one or more practices, changing only the info (Name, Alias, Tags, Favorite status) will affect ALL instances of this workout used in practices, while changing the "guts" (Course, Workout Type, Sets, Swims, Rests, Notes) will only affect this workout in the library and leave alone the prior versions used in workouts. There are times the checkbox is enabled and thus able to be unchecked. When editing a workout in a practice that does not have a test set, enabling you to create a variant of the master workout without saving it. Changing the guts of the workout only affects it in the practice, while changing only the info affects ALL instances of this workout used in practices, even with the checkbox unchecked. Adding or editing* a set in My Sets. Adding or editing a test set in a workout. If test set has recorded results, you cannot even edit it; you can only clone it. *Editing the "guts" (Circuits, Swims, Rests, Notes) of a set that’s been used in a workout will edit the master but leave all the versions in prior workouts alone. Changing just the info (Names, Tags, Favorite status) affects ALL instances of this set used in workouts. When adding a set to a workout that is not a test set, enabling you to create a “throwaway” set. When you uncheck the box, the Set Name is not required, and options to make it a Favorite, Test Set and add Tags disappear. When editing a set in a workout that is not a test set, enabling you to create a one-off variant. 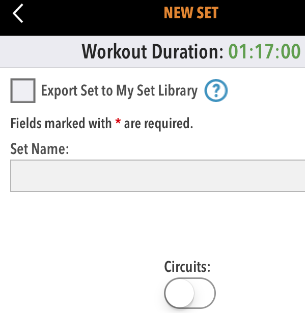 Note that if the set only exists in this workout, it will change this set in the library as well. What's important to note when making one-off variants to the guts of existing sets in workouts and workouts in practices is that all historical versions stay the same, including attendance data.